Pittman Asphalt Maintenance is based in Holland, Michigan and we are proud to work with home owners & businesses across all communities in West Michigan. We provide asphalt maintenance services designed to extend the life of your asphalt driveway. 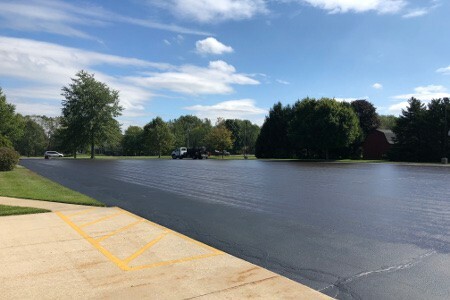 Our driveway paving services includes seal coating, asphalt patch repairs, and filling those annoying cracks that Michigan winters expose over time. Call us today at (616) 786-2923 for a Free Estimate on any driveway paving service or Contact Us via email. "Seal Your Asphalt every 2 years!" Sealcoating your driveway every 2-3 years will extend its life. We provide spray-on and squeegee applications for sealing your driveway. Sealcoating will make it look new again. Sealing is a manual process via a squeegee and will cost more due to the labor. Materials used are almost identical between spray-on sealcoating and sealing. Pittman Asphalt Maintenace fixes potholes with overlay patches, fills, milling, or we'll completely cut out the section & replace it. Please call us at (616) 786-2923. 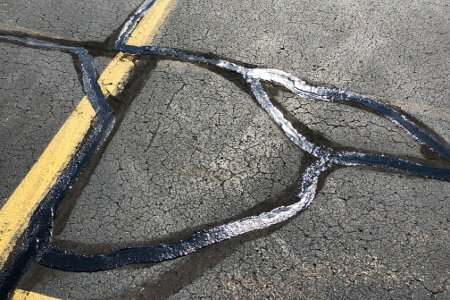 Filling cracks in asphalt should be done routinely. Cracks allow water, oils, and vegatation to grow which causes further damage. Extend the life of your driveway today! 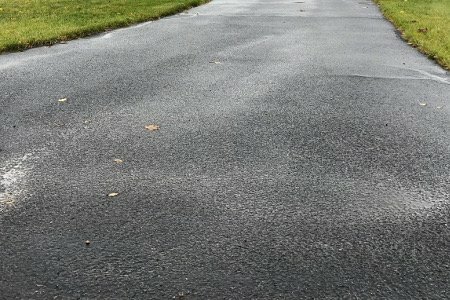 Cracks in Asphalt - Importance of Repairing? In our industry, we say “Cracks become Potholes, and Potholes become Craters”. Fixing cracks & potholes are minor expenses versus the eventual cost of replacing your entire driveway. Businesses have done the case studies and found it’s much cheaper in the long run to have a maintenance program in place for their parking lots. We encourage homeowners to do the same. 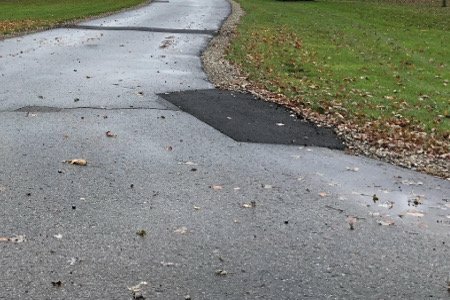 Other reasons to fix cracks in an asphalt driveway? Preparation is the most important step in this process as well the temperature when sealing is done. In certain instances, cracks may need to be routed while larger cracks can just be cleaned. Once everything is cleaned, a sealant will be used to fill the crack. Patching can be done in four forms. 1) Saw Cut Patches – involves the removal of the entire section and is considered a longer term fix. 2) Milling – involves milling 1.5 inches off, clean tack coat, replacing with new 1.5 inches of asphalt. This is considered a longer term fix. 3) Overlay Patches – involves putting a fresh layer of asphalt over the problem area and is considered an interim fix. 4) Pot Hole Fills – involves cleaning out the hole with a wire wheel and simply filling it with an asphalt patch. This is also considered a short-term fix.